“The Gariban Project #1: A Device for Two extends Orimo’s investigation of layered forms of cultural communication and messaging. 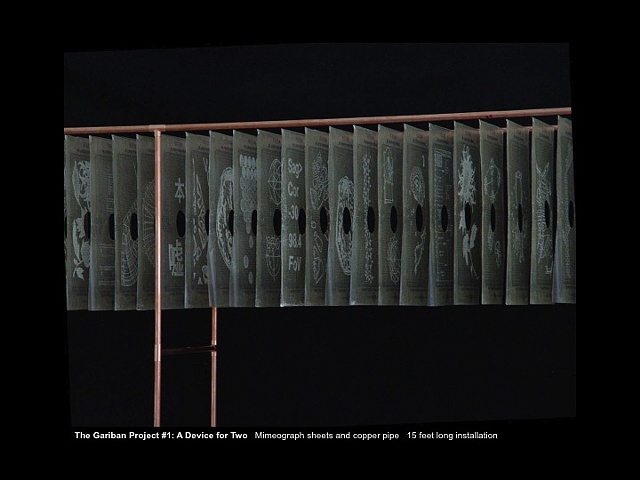 The installation incorporates multiple sheets of traditional Japanese “Gariban” mimeograph paper. “Orimo was interested in incorporating this early form of mass communication in a sculptural context that invites intimate communication between two people. Onto the individual sheets of paper, the artist has inscribed images culled from medical science, geographic maps, Japanese textiles and native flowering plants.